Għajn Znuber Tower, which had been falling to bits up to some months ago, is approaching the end of a restoration process which will see it start new life as a visitors' centre. 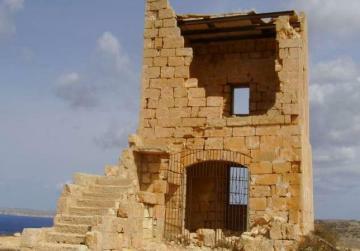 The building, which was actually a fortified farmhouse, is also known as Ta' Ciantar farmhouse or Ta' Torri Ciantar. The state of the tower before restoration began. The restoration is being carried out by the Resources Ministry and the management of Majjistral National Park. The structure is believed to have been built in the late 19th century. It was last used during the Second World War as a lookout post. After the war, the tower was abandoned and suffered from neglect and vandalism. The building consists mainly of two good-sized rooms above each other.The south-facing façade had to be dismantled as the central arch had become unstable and other stonework had collapsed and needed to be rebuilt using coralline limestone like the original. A concrete staircase was demolished and rebuilt with globigerina limestone.